The Cure in Africa – Pedalboards of Robert Smith and Reeves Gabrels! The following is a guest post by Omar Findlay. If you are interested in guest posting, please contact me! 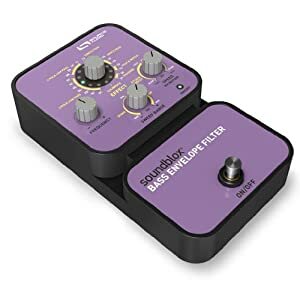 In this review I’m going to be talking about the SoundBlox Bass Envelope Filter, a new toy from the folks at Source Audio. It’s a funky little effect for your bass if you’re looking for something to spice up your pedal board a bit. This will definitely do the trick, and despite the minimalist interface, it has a lot under the hood. The BEF has 21 preset envelope effects, which is an offering that other filters lack. The interface contains a minimal number of knobs (4) and each are clearly marked for their functions. The pedal itself takes up a little more space on a board than one might prefer, but it’s a minor thing since there are much larger pedals on the market. The power jack and input/output jacks are easily accessible and don’t get in the way. Time to plug it in and see what it can do! The first thing that you’ll notice about the BEF is that it has 21 presets, each of which have a core setting, and are further adjustable with the other three knobs. The effects are categorized by filter setting (peak and notch, single/triple peak, 2/4-pole low pass, phasers) and all have their own unique sounds; he manual explains each effect in detail, which is very handy. The other three knobs allow you to get the exact sound you’re looking for once you’ve found your desired effect; ‘tone’ selects the centre frequency, ‘speed’ sets the filter’s attack and decay, and ‘sweep range’ determines the direction (negative/positive) and width (narrow/wide) of the frequency sweep. Any combination of those three knobs gives you access to thousands of sounds, which you’ll be discovering daily. Source Audio has made this (and its other pedals) Hot Hand ready, which means that you’re able to plug in an accessory (sold separately) to the unit and manually control the filter sweep with your hand, finger – whatever you attach the ring to – thus making it similar in operation to a standard bass wah pedal. The Hot Hand is very useful because it gives you additional control without you having to adjust the pedal during a performance. Plus, the ring looks cool. What more could you ask for? pros: 21 presets, plus the ability to adjust them and get tons of different sounds out of them. This unit is also very easy to use and quick to learn. Cons: no wet/dry knob (very minor issue). If you’re looking for a good envelope filter that can do what the others can and more, don’t overlook this pedal. It’s versatile, it looks cool, it’s got 21 presets, a ‘handy’ accessory, and best of all… it costs less than the others but does just as well. Sure, there’s no save function for all the settings you’re going to find, but that’s a small price to pay for something that is very well-designed and very capable. Free Shirt Wednesday - 6/22 - Killer Guitar ComponentsCommunity Question Responses: What pedal do you have on your board that you're wanting to replace? What would you like to replace it with and why? EffectsBay.com is a participant in the Amazon Services LLC Associates Program, an affiliate advertising program designed to provide a means for sites to earn advertising fees by advertising and linking to amazon.com. Please view Affiliations below for additional information about links. This means that some links will go to their website and EffectsBay.com can potentially receive a commission for items purchased there. Or in the case of Rattlesnake Cable Company and Pedal Labels, they are owned by the owner of Effects Bay. We will also disclose if reviewed products were kept when sent by the manufacturer to us for review. Interested in advertising on the site or submitting products for review and/or giveaways? Send me a message!